I was on Bold TV a few weeks ago talking about What’s Best Next and how the Golden Rule is at the heart of how to be productive. I had a great time, and you can watch the segment above or watch it on their website. I’d also recommend Bold TV in general as something to check out. It’s a great example of innovation and, beyond that, the business philosophy of respect that I advocate for in my books and on this blog. It especially does this in the realm of politics, where respect is especially needed today. Bold TV is a digitally native news network committed to bipartisan dialogue and innovation for people, businesses, and communities. It was founded in conjunction with Al Roker Entertainment. Bold hosts three one-hour online shows per week (Bold Politics, Bold Life, and Bold Biz), and you can also access the segments (as well as relevant articles) on their website. Their live shows run on their Facebook page on Fridays beginning at 10:00 Eastern. Bold Politics is co-hosted by Carrie Sheffield and Clay Aiken. Carrie is the founder of Bold, a leading entrepreneur, a political analyst, and had an accomplished career in journalism and finance prior to beginning Bold. Clay, as you may know, should have won the second season of American Idol! (Though Ruben Studdard, who won that year, was great also.) He is also very sharp politically and in 2014 ran for congress in North Carolina’s second congressional district. Here are two key things to note. First, Bold TV is digitally native. That is, it has the principles of online communication and the new economy baked into it from the start. Instead of being a meatball sundae of taking an older business model and retrofitting the Internet on top of it, it shows us what a “digital first” media business model looks like. As such, it is at the leading edge of new media programming today. Second, Bold is bi-partisan and dialogues respectfully about differing viewpoints. It seems like so much political discourse today is carried out with a bitter spirit, and that many news outlets today are profiting from conflict. Regardless of how strongly we feel about things, it does not have to be that way. You can disagree with someone and still respect them. This is how discussion and debate are supposed to proceed. Bold embodies this, bringing on guests from both sides of the political spectrum. Further, the hosts themselves represent this, as Carrie is a strong conservative and Clay Aiken is on the liberal side. Instead of seeking to profit from conflict, Bold is based on cooperation—which is a much-overlooked, but central, principle of the new economy. Businesses that seek to profit from conflict are operating according to the old model, and this will not last. Bold’s style represents a much better way forward in the political discussion of our nation today. Bold TV is worth checking out and tuning in to as a leader in this much better (and, I would argue, more effective and more human) approach. I was on Pete Mockaitis’s How to be Awesome at Your Job podcast the other day, and really enjoyed it. You can listen below or at the website, where you will also find helpful links to the various books mentioned and some relevant previous episodes (for example, his episode with David Allen). 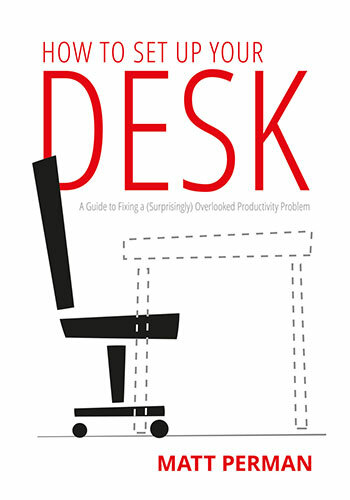 Pete is doing great work and I highly recommend his website and podcast for specific, actionable insights that will boost your work performance. Matt Perman explains how to tell the difference between important tasks and urgent tasks, and how to make room for what’s important in your life and work. This is a basic marketing principle which Seth Godin summarizes very well. Seems obvious, but it is often overlooked! If an Apple upgrade breaks your phone and you switch to Android, it costs Apple more than $10,000. If you switch supermarkets because a clerk was snide with you, it removes $50,000 from the store’s ongoing revenue. If a kid has a lousy first grade teacher or is bullied throughout middle school, it might decrease his productivity for the rest of us by a million dollars. Torrents are made of drips. The short-term impact (plus or minus) of our work or our errors is dwarfed by the long-term effects. Compounded over time, little things become big things. In other words, courtesy and generosity are not only good for business — they are essential for business when you look at things from the long-term perspective. This goes back a couple years. I just came across online the message I gave at the 2015 Work as Worship Conference. Here is a summary of the message I gave and, I believe maybe if you log in, the audio. Business leaders hold a critical place in the world because work serves as one of the chief means God uses to change culture. Because of this, work carries tremendous value in the life of every Christ follower. 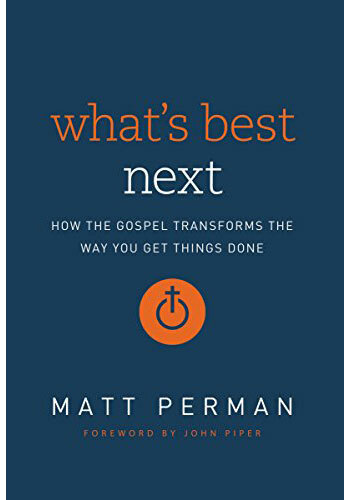 In this 29-minute session from the 2015 Work as Worship Conference, Matt Perman, author and founder of WhatsBestNext.com, speaks on the significance of accomplishing work in a gospel-centered way. “Christians must be different from the world.” Whenever we hear this statement in sermons or read it in books, we usually think about our behavior, right? We nod our heads and think, Yes, our actions must set us apart! But there’s another application of this statement that is equally important. Christians must be different from the world in the way we think. That is a fantastic point. But how are we to develop our thinking as Christians? The new Worldview Study Bible is one tool to help—and it succeeds admirably. The first way it succeeds is in showing the importance of intentionally developing our worldview as Christians. Everyone has a worldview, it points out. So we need to take to the task of developing an accurate, truthful, and biblical worldview. God left us with something better than a simple list of commands. He gave us renewed minds that–through the power of his Spirit–will be able to discern what actions we should take. He is seeking to transform us so that we can determine God’s will in particular situations where explicit instructions are not spelled out in Scripture. From even just a short time with this study Bible, I have been renewed in my conviction of the importance of biblical, worldview thinking. Second, this study Bible succeeds in equipping us to develop an accurate worldview on the specific issues that are most facing us today. It is highly relevant to our era, and deals with the issues concisely, powerfully, and biblically. The Bible also has great introductions that highlight the main worldview contributions of each book, the CSB translation it utilizes is good (using an optimal equivalence translation philosophy, which affirms formal equivalence while addressing its limits), and is well put-together, with Smyth-sewn binding. There are lots of study Bibles out there. This one stands apart! Update: LifeWay.com currently has the Worldview Study Bible available at a 50% discount for the next few days. What’s Best Next received this Bible for free in exchange for our honest review. People often say that “doing less” and “saying no” is the key to productivity. But this advice actually doesn’t work — unless you include with it the necessary corollary. When you do that, you have perhaps the guiding concept for being effective. What Does Jesus Mean When He Says “Hate Your Life”? “Whoever loves his life loses it, and whoever hates his life in this world will keep it for eternal life” (John 12:25). I don’t think he means that we are supposed to engage in self-sabatoge to make our life harder than it has to be. For example, I heard of a charity in the developing world once that refused to have a hot water heat put in, even though donors had fully provided for it, because they believed that there was extra virtue in having to put up with just having cold water. That’s not the meaning of hate your life! Instead, I think what Jesus means is that following his commands is hard. Which means that, at one point or another, there is going to be a cost to it. As a result, sometimes when we follow his commands, life will go “less well” for us in this world. It will look like we hate our lives. Because we do in the sense that Jesus intends here — we love them less than him. And so whenever there is a conflict between what he commands and what will go better for us, we follow his commands. And we do this, if necessary, even to the pointing of losing our lives in martyrdom (Revelation 12:11). Now, let’s apply this to productivity. “Hating your life” does not mean you don’t seek to grow your business as much as you can, or that you don’t seek to advance in your career. Rather, it means that you do so in line with Jesus’ commands. That will often involve sacrifice. But you don’t sacrifice for its own sake. To go back to the example of the charity. If there was another charity nearby that needed a hot water heater, and only one was available, it certainly would be right and good for them to say “give it to them — we will continue to do without.” That’s Christian love (Philippians 2:4ff). But to refuse the increased productivity and better tool out of some principle that advancing and having better tools is not healthy and good — that is not what Jesus is talking about. Last week I blogged about the upcoming conference, The Gospel and Our Cities. I’m excited for it because I love the three things it is about: the gospel, cities, and gospel movements. But since the focus of this blog is productivity, we need to ask this question: What do cities, the gospel, and productivity have to do with one another? In fact, if we don’t connect cities to our understanding of how the gospel advances, we will be much less productive in our work and ministry. First, we need to understand the in the Christian view, productivity is not just about our own effectiveness and peace of mind. Rather, a gospel-minded Christian also cares about their community and all of society. Our aim is not just (or chiefly) to make ourselves better off; our aim is to see society better off because the greatest command is to love God with your whole heart and your neighbor as yourself. Further, our concern for the surrounding culture is holistic: we want to both serve the common good and see the gospel advance. How are we doing with this? In other words, in spite of our numbers, we are not being “productive” in serving and renewing the culture. Our impact is far less than you would expect from our numbers. It’s because, contrary to popular belief, culture is not simply the result of the number of people who hold to a certain view. Rather, culture is created in networks and institutions. Hence, you cannot change culture if you are absent from those networks and institutions. Since evangelicals are largely absent from the centers where culture is created, our impact on the culture has been small — even though our numbers are very large. People who live in large urban cultural centers, occupying jobs in the arts, business, academia, publishing, the helping professions, and the media, tend to have a disproportionate impact on how things are done in our culture. Hence, if as Christians we are going to have a greater impact on the culture, we need to have an impact on the city. What kind of impact do we want to have on the city? We don’t believe in imposing a Christian worldview. Rather, as mentioned earlier, our aim is twofold: to further the common good and advance the gospel. When it comes to the common good, the aim is to make things better socially and economically, as well as in the spiritual dimension. To bring justice, truth, beauty, respect, and generosity more to bear in all aspects of life. Leading from respect and service rather than command and control; making more usability products; and treating employees with generosity and trust are all examples of things that further the common good. When it comes to the advance of the gospel, this means more people coming to faith in Christ and following him fully. This matters in itself — it is not simply for the goal of culture change. But it will have an impact on the culture when people come to faith and see that faith relates to all of life, and is not just individual pietism. So the impact we seek to have is more people coming to faith and, in turn, living out their faith holistically in all of life — including in the institutions where culture is shaped and formed. Further, this cannot happen to a large extent across the nation if we ignore cities. For cities is where most of the people are, and cities are where most culture is forged. What it takes to reach a city is a city-wide gospel movement, which means the number of Christians across the city is growing faster than the population, and therefore, a growing percentage of the people of that city are connecting with gospel-centered churches and are finding faith in Jesus Christ. That will eventually have an impact on the whole life of the city. That’s what I mean by a city-wide gospel movement. In other words, it takes more than just one church or a few committed Christians to reach a city. It takes a movement of Christians, including churches of all kinds of denominations and styles. How Do You Build a Gospel Movement in Your City? That’s where I think we need to do a lot more work as Christians. A great place to start is by attending Redeemer City to City’s upcoming fall conference, The Gospel and Our Cities. It is in Chicago this October 18-20. By attending, you will not only learn about the city, creating gospel movements, urban challenges, faith and work, and more; you will also have a chance to meet others in your city and develop the networks necessary for a gospel movement to start. The way we are serving and renewing the culture right now is not very productive, because it de-emphasizes the place of the city and gospel movements. It’s time to learn the more productive approach of reaching cities through gospel movements. That’s how a concern for productivity and the gospel leads to a concern for cities and gospel movements. Register at the website, and use the code “chicago” to save an extra $25 before June 4! Central to good time management is doing what is important, not merely what is urgent. Yet, how do you know what is important? Importance is something even deeper than your own goals. Important things are things that align with correct principles and God’s truth. And that takes us to the heart of why character is essential to productivity, for principles bring us into the realm of character. There are two sources for knowing correct principles. First, the Scriptures: “Blessed are those whose way is blameless, who walk in the law of the LORD!” (Ps. 119:1). And second, we have the capacity to discern correct principles through our conscience, which is directly informed by our understanding of the Scriptures. We have an inner compass that enables us to detect what right principles are. The way to put first things first is to build this inner compass—that is, our character—so that we are able to discern what right principles are and desire to follow them. Character enables us to see and understand correct principles so that we can base our lives and decisions on them. That is why character is central to true productivity. We then can articulate our mission and values flowing from those correct principles, and our personal vision can become an accurate way of identifying what is important. This is at the heart of time management and why productivity is rooted first in character, not techniques, for it is character that enables us to discern what is important and use the techniques well.